IXQ TV provides no information on their website about who owns or runs the business. The IXQ TV website domain (“ixqtv.com”) was registered on April 26th, 2018. David Bremner is listed as the owner, through an address in the US state of Virginia. Bremner appeared on BehindMLM’s radar in March 2015, as owner of vStream TV. vStream TV sold $349 streaming boxes preloaded with access to pirated content. At the time of publication the old vStream TV website now redirects to something called Lifestyle Savings Network. This appears to be another MLM company owned by David Bremner. A Kodi Android box is still sold by Lifestyle Savings Network, although Alexa traffic rankings for the vStream TV website domain suggest the company is all but dead. Read on for a full review of the IXQ TV MLM opportunity. IXQ TV markets an “unlimited streaming” service starting at $39 a month. 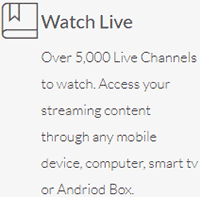 Over 5,000 Live Channels to watch. Access your streaming content through any mobile device, computer, smart tv or Andriod Box. You will get access for up to 6 devices to be logged in at the same time. No more fighting over who watches what. IXQ TV affiliates are paid commissions both on the sale of retail stream subscriptions and on recruitment of affiliates. In addition to direct and residual commissions, several performance-based bonuses are also offered. There are thirteen affiliate ranks within the IXQ TV compensation plan. Note that no more than 75% of required GV can come from any one unilevel leg. GV stands for “Group Volume” and is sales volume generated via retail subscription sales and IXQ TV affiliate recruitment. A retail subscription generates 25 GV a month. A recruited affiliate generates 40 GV a month. IXQ TV pays both a direct and residual commission on IPTV subscriptions sold to retail customers and recruited affiliates. When a new retail customer or recruited affiliate signs up with a plan, a four-level deep commission is paid out via a unilevel compensation structure. Although not explicitly clarified in the IXQ TV compensation plan, I believe annual retail subscriptions pay the same initial commission as monthly subscriptions (recruited affiliates only appear to have a monthly option)..
After the first month retail commission has been paid out, each month thereafter pays a $10 commission to the referring affiliate (single-level). For ongoing payment of recruited affiliate fees, the commission paid out is $15 a month. Again I believe monthly and annual subscriptions are paid out the same (even though annual subscriptions are prepaid, the monthly commission is still paid out monthly). IXQ TV pays out residual commissions using the same unilevel compensation structure as direct retail commissions (see “retail commissions” section of this review). A retail IXQ TV subscription sold generates 25 PV a month. Recruited affiliates generate 40 PV a month. PV stands for “Personal Volume” and is individually tracked sales volume generated by an IXQ TV affiliate. Both retail and recruited affiliate PV is paid out down eight levels of an affiliate’s unilevel team. The Matching Bonus is paid out on residual commissions earned by recruited affiliates. The Generation Bonus allows an IXQ TV affiliate to earn beyond only eight levels of their unilevel team. A generation in the IXQ TV compensation plan is defined when an affiliate at the same or a higher rank is found in a unilevel leg. This affiliate caps off the first generation for that leg, with the second generation beginning immediately after. If a second equal or higher ranked affiliate is found deeper in the leg, the second generation is capped off and the third begins. If no second affiliate is found, the second generation extends down the full depth of the leg. Note that generation calculation for each unilevel team leg is independent of other legs. Using the above generational structure, an IXQ TV affiliate can earn a 1.5% Generational Bonus on up to three generations per unilevel leg. Note that rank must be held for two consecutive months to trigger the Rank Achievement Bonus. Ruby, Emerald and Diamond Rank Achievement Bonuses are paid out over twelve months (rank must be maintained). Note that for the first Lifestyle Bonus tier ($5000 a month), no more than 50% of counted retail subscribers and/or recruited affiliates can come from any one unilevel leg. For the $10,000 and $20,000 a month Lifestyle Bonus, no more than 25% of counted retail subscribers and/or recruited affiliates can come from any one unilevel leg. IXQ TV affiliate membership is $59.95 a month. Whereas vStream TV sells hardware boxes through which pirated content is accessed, IXQ TV ditches the hardware and just provides the streaming service. Your first red flag is the lack of disclosure regarding whether or not IXQ TV has permission to broadcast copyrighted content it advertises access to. Watching TV content streamed over the internet is legal. However, it is not legal to download or record any material that is copyrighted. Some IPTV services stream content from servers that have recorded the content, and many times the content is copyrighted. Even though you are watching it as it as streamed, such as a movie-on-demand, since someone had to record the content in order for you to be able to watch it, copyright laws may have been violated. That is why IXQTV does not have any VOD content. As for the streamed content, the aggregator of the content that ixqTV uses purchases content from the content owners through arrangements known in the industry as “carriage deals”. The rates the aggregator pays for the right to stream this content are determined by a fee scale based on how many customers will be viewing the content. Because the aggregator is licensed to stream the content through these carriage deals with the various content owners, and because IXQTV does not stream recorded content, IXQTV is legal. TL;DR – IXQ TV are passing off the legality of streamed content to their “aggregator” service. If the aggregator was legitimate and had permission to broadcast content, IXQ TV would have no reason to hide who the aggregator is. From IXQ TV failing to disclose who their aggregator is (read: who they pay a monthly fee for access to streams from), it’s a safe bet the majority (or even none) of the streamed content isn’t licensed. This means that IXQ TV are provided access to illegal content, but they’re passing the buck on legality to their stream provider. The problem is this isn’t how copyright law works, as evidenced by Dish Network recently going after TVizion. If IXQ TV can’t provide evidence they have permission to broadcast advertised stream content, they’re breaking copyright law. Although admittedly unlikely, IXQ TV affiliates could also be targeted by copyright holders. With respect to IXQ TV’s compensation plan, for no particular reason it pays more to recruit affiliates over retail customers (both are given access to the same pirated stream content). This tilts the compensation plan toward affiliate recruitment. Not helping is a lack of retail volume requirements, meaning an IXQ TV affiliates can advance through the compensation plan on recruitment alone. I’d typically advise to check with your potential IXQ TV affiliate as to how they’ve built their business (retail subscriptions vs. recruited affiliates), but given the stream piracy question it’s a moot point. David Bremner launched vStream TV back in 2015. He’s had roughly four years to provide evidence vStreamTV has permission to provide stream access to copyrighted content, which he hasn’t. it’s a safe bet the majority (or even none).. I think you mean “minority”, Oz. edit: actually I forgot to change is to isn’t. Doh! I remembered these frauds a few years ago claiming that the magic mantra “streaming is legal” would solve everything. Of course, explaining that “streaming is legal” was a strawman- nobody was arguing that streaming wasn’t legal- it is streaming (or otherwise broadcasting) STOLEN CONTENT is very illegal. Somebody local was advertising their referral links to this garbage and I thought it sounded pretty sketchy. I was googling for info about what channels are offered, what prices are, HOW THIS MLM WORKS, and how it’s even legal. So much damn secrecy! ixqtv.com/images/IXQ_Channels.pdf Found this link. Are you telling me I can get HBO and other fancy channels for like $39/month minimum? My scam radar was going haywire. I have relatives looking into cutting the cord and I know some of them are gullible enough to jump at the chance for “thousands” of channels for $51/month or less. The fact that a KNOWN sketchy dude is behind this makes me pretty mad, honestly. I’m petty enough to report this so channel companies can look into the legalities of this but I have no idea where to start. It seems like an international thing but calling up the Feds seems a bit too much, lol. Thanks for the good job exposing scams like this, I’ll definitely subscribe for more!